Yesterday, I had a wonderful opportunity to share with students at Dawson College in Montreal, QC about career pathways in the peace field. I was invited by the Peace Centre at the college. I’ve known about the important work at Dawson for many years in the peace field: an impetus for the efforts was a shooting on campus in 2006 . 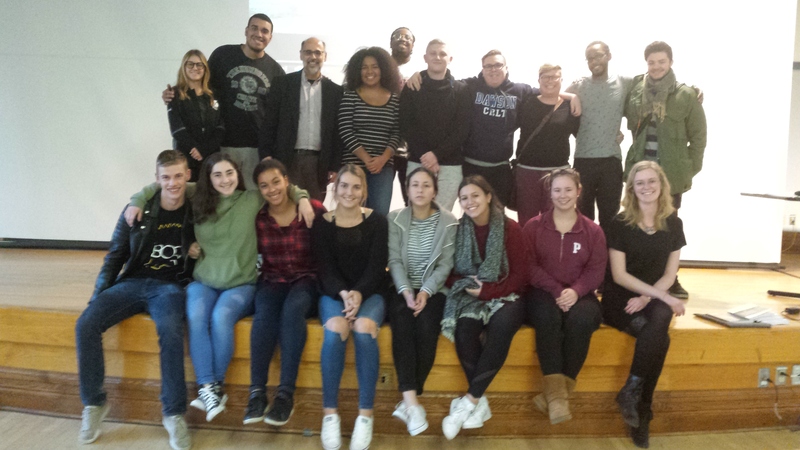 I want to give a shout out to Pat Romano, who established the Inspire Solutions project at the college which focuses on promoting a culture of nonviolence and peace. A major current initiative of the project is Resist Violence which works to understand the culture of violence that permeates society. I was glad to have lunch with Pat, and appreciate her dedication and vision. Afterwards, at the invitation of Diana Rice I spoke to about 30 students, many of them in the Peace Centre’s certificate program. Most were taking peace courses to supplement their degree in Community Recreation and Leadership Training. In my talk I shared about the changing nature of work today looking at the uncertainty of jobs and the emerging gig economy. We talked about the importance of seeking meaning at work. I also talked about the need for soft skills, designing a career path, and crossing boundaries. Students were interested in pursuing both global and local based work. Canadians often take a global view of their place in the world, so being interested in international careers was not a surprise. A few students were looking at NGO and UN based careers. But students also recognized the need to work in their own local environments where peacebuilding strategies can be helpful. One student asked about how to prepare for a global pathway: I emphasized the need for overseas experience such as in study abroad, and learning multiple languages (many Canadians have mastered English and French). Working across borders to offer young people ideas for their futures is important. The opportunity to talk with Canadian young people reminded me that all would-be peace practitioners are in need of ways for channelling their passions.